governs the preparation of endocrine tissues and release of eggs, while the menstrual cycle governs the preparation and maintenance of the uterine lining. These cycles occur concurrently and are coordinated over a 22–32 day cycle, with an average length of 28 days. 1. Which of the following statements about hormone regulation of the female reproductive cycle is false? A) LH and FSH are produced in the pituitary, and estradiol and progesterone are produced in the ovaries. C) Both progesterone and estradiol are produced by the follicles. D) Secretion of GnRH by the hypothalamus is inhibited by low levels of estradiol but stimulated by high levels of estradiol. 2. Which of the following statements about the menstrual cycle is false? 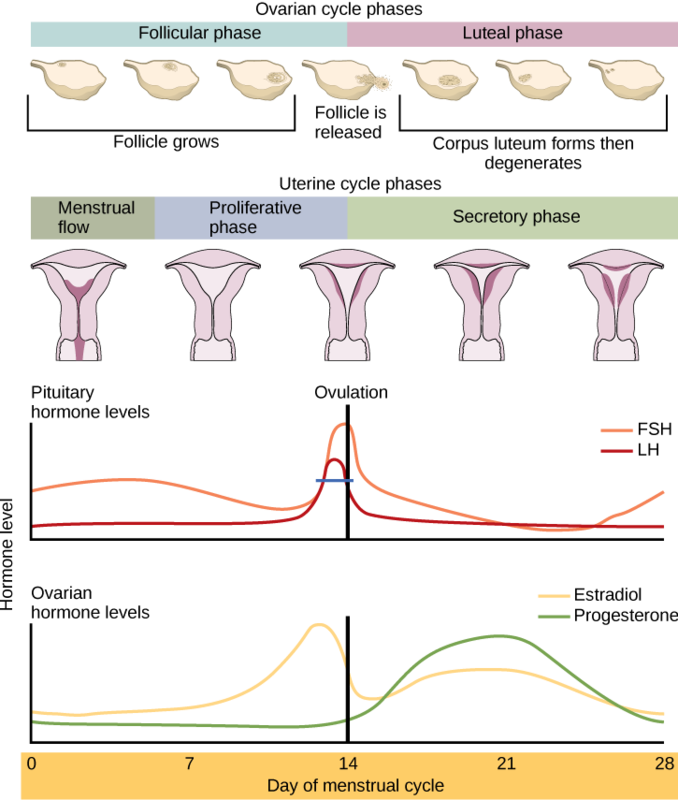 A) Progesterone levels rise during the luteal phase of the ovarian cycle and the secretory phase of the uterine cycle. B) Menstruation occurs just after LH and FSH levels peak. C) Menstruation occurs after progesterone levels drop. D) Estrogen levels rise before ovulation, while progesterone levels rise after. 3. Which hormone causes Leydig cells to make testosterone? 4. Which hormone causes FSH and LH to be released? 5. Which hormone signals ovulation? 6. 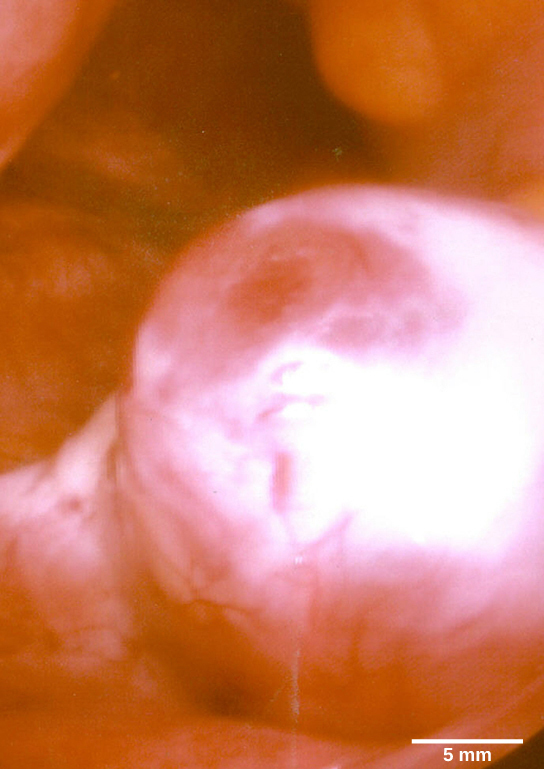 Which hormone causes the re-growth of the endometrial lining of the uterus? 7. 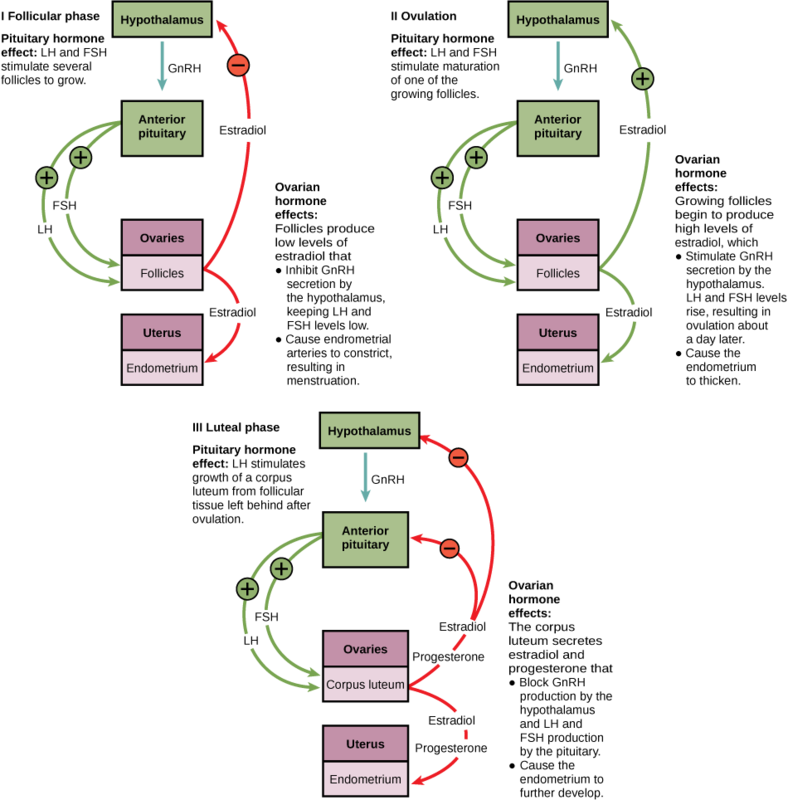 If male reproductive pathways are not cyclical, how are they controlled? 8. Describe the events in the ovarian cycle leading up to ovulation. 24.4. Hormonal Control of Human Reproduction Copyright © by laesoph. All Rights Reserved.